Dr. Neufeld was invited to address a conference hosted by an international adoption agency on this subject. The art and science of transplanting children needs to be founded on a firm foundation of understanding the attachment needs of children and the effects of early attachment disruption. 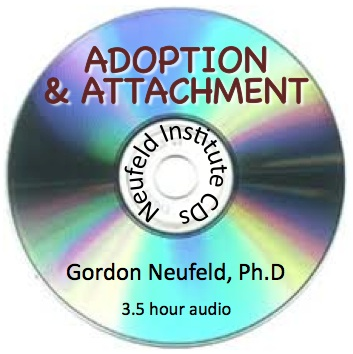 Dr. Neufeld shares insights that stem from his mastery of the developmental literature as well as his many years of experience consulting for adoptive parents. In this presentation, he discusses how attachments are meant to develop and how adoption can impact this. He discusses the normal reactions to attachment disruption in children and the problem of competing reactions in dealing with adoptive children. Also discussed is how to bring adoptive children into right relationship with their adopted parents. This material is also applicable to other arenas that involve parenting another's child, especially foster parenting and step parenting.